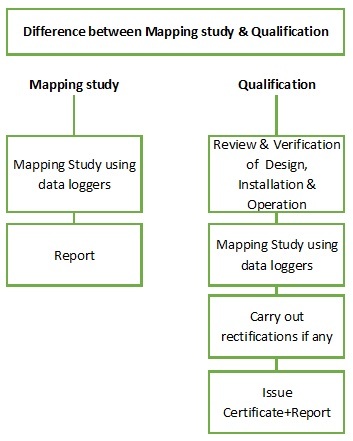 Pharmaceutical and FMCG industries often use the words Mapping study and Qualification study interchangeably. However, there is a slight difference in the scope of work which we explain as below. Design qualification process to verify the design aspects. This process verifies that the design of equipment is suitable to generate the desired temperature and humidity conditions. Installation qualification process is for verification of the installation of the equipment. This ensures whether the installation is carried out as per the design and as per the installation procedures recommended. The respective manufacturers of critical equipment issue such installation process. Document verification is to verify whether all documents are maintained by the user including SOP, calibration certificates etc. Temperature mapping study (and Humidity if required) is more or less same as defined in the first par t of the guide. In a temperature mapping study, only distribution of temperature & humidity is analyzed. This study makes sure that the distribution is always within the permitted range of temperature and humidity as applicable. However the mapping study does not check various criteria such as SOP, whether the installation has been done correctly, whether the machines are working as per the design, whether written procedures are maintained, whether these written procedures are sufficient etc. All such parameters are covered in a temperature qualification study. A temperature qualification study includes mapping study, but not vice versa. How to decide whether you need Temperature Mapping study or Temperature Qualification Study? If you want to check the only distribution of temperature & humidity, a mapping study is sufficient. If you want to check whether the whole asset is designed, installed and operated correctly, it is desirable to carry out a temperature qualification study. A qualification study is considered to more of international acceptance. An auditor from another part of the world may not be familiar with the various installation and operational parameters of the asset. If an asset is qualified the asset is considered to be a fully satisfactory system. Temperature Qualification for Cold Rooms, Vans, Boxes etc.